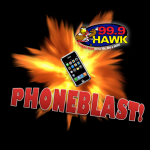 Today and every Friday from now on… by YOUR request… we playback some of the best pranks we pulled with our Phone Blasts! We are going to do Flashback Phone Blasts and this one was one of our wildest ones that almost got us in a whole peck of trouble with. We were enlisted by this guy’s son who claims his dad loves his classic automobiles more than he love him… so we had just a little too much fun with this call… yikes!